Woodberry Down. Photograph: Hackney Council. Award-winning regeneration plans for a Hackney estate could result in the loss of hundreds of socially rented homes, figures sourced by the Green Party suggest. Hackney Council decided to demolish and rebuild Woodberry Down estate back in 1999, kicking off a 20-year programme in collaboration with developer Berkeley Homes, Genesis Housing Association and local residents’ groups. Phases 2-8 of the regeneration plans will represent, on completion, a net loss of 645 socially rented homes for Hackney, according to figures sourced from the London Development Database by Green Party co-leader Siân Berry AM. Simon Elmer of Architects for Social Housing called the figures “grim reading”, and called on local authorities to prioritise refurbishment or infilling on vacant land rather than suffering the built-in costs of demolition-led redevelopment. Elmer said: “These figures are far worse than we feared. By demolishing our council estates and replacing homes for social rent with so-called affordable housing and properties for market sale, the housing crisis is expanded at the cost of the increased housing poverty and homelessness of its citizens. “The possibilities of estate regeneration become radically reduced as soon as an estate is demolished. Whilst Hackney Council have hotly contested Berry’s findings since the City Hall Greens released London-wide figures back in September, the Town Hall has to date been unable to directly refute them with statistics of their own. The lack of council-backed stats for homes previously demolished on Woodberry Down has been blamed on poor record-keeping dating back to the early 2000s. However, it is understood that the council accepts that net loss of social housing will nevertheless run into the hundreds as a result of the regeneration of the estate. City Hall Greens defended the veracity of the findings as sourced from all planning permissions in the London Development Database from 2003 up to May 2018. The data was then broken down by type on homes signed off for demolition and new homes built, enabing a comparison of the amount of council housing on all sites before and after redevelopment. Berry said: “We desperately need more council homes everywhere in London – too many families who are entitled to social housing are waiting for years struggling to get by on low wages and paying exorbitant private rents. The numbers of properties set to be provided under large schemes such as Woodberry Down are prone to fluctuation as the Town Hall seeks to maximise the amount of socially rented homes as each new phase of construction is delivered. According to the council, Phases 2-8 of the project are now set to provide 1,074 more residential units in total than the 3,242 initially promised, with a target of 41 per cent for social rent or shared ownership. The Royal Institution of Chartered Surveyors (RICS) recently honoured Woodberry Down with its 2018 London Project of the Year award, as well as its Regeneration award, for “overall outstanding best practice and an exemplary commitment to adding value to its local area”. RICS have stated that they stand by the award for “providing place-shaping, social and economic change on an inspiring scale”, as projects are considered in isolation from what they replace. A RICS spokesperson said: “The project impressed the judges, as it had a strong focus on improving local economic wellbeing through a comprehensive range of events and initiatives. “The council, developer, housing association and residents all worked on the project together and to provide quality new homes with access to community facilities, and other amenities. “Meanwhile, initiatives to help residents get back into employment include an enterprise programme which has already helped some local residents set up their own businesses, whilst a pop-up construction skills training academy has delivered £100,000 of free training to 90 local people in the nine months it was open. 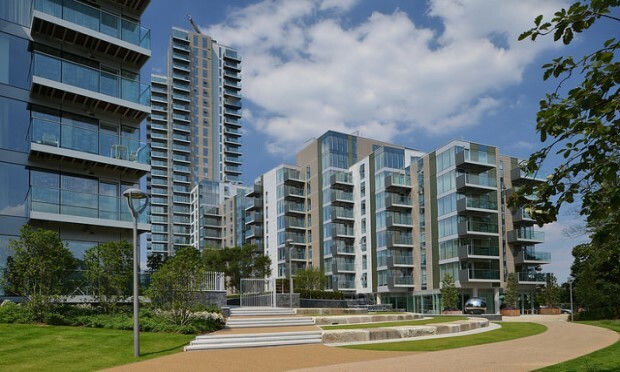 RICS added that Woodberry Down has delivered 1,628 new homes to date, as well as new amenities including a secondary school, community centre, shops, and 2.61 acres of award-winning parkland, with a stated “social return” on investment calculated as £2.51 for every £1 invested. Hackney Mayor Philip Glanville has pledged that the council’s direct delivery model, by which the Town Hall acts as its own developer rather than partnered with private companies, would complete nearly 2,000 homes with more than half for social rent and shared ownership, with a net addition of homes for social rent across the programme. Glanville said: “Plans for the regeneration of Woodberry Down started more than 15 years ago and pre-date the council’s in-house delivery model. “Construction began in a period when councils were essentially prevented from directly building homes and went on site for delivery in the teeth of the Great Recession around 2008.